A survey of financial journalists revealed a stark political contrast, with 58 percent of respondents describing themselves as liberal against just 4 percent calling themselves conservative. The study, conducted by professors at Arizona State University and Texas A&M University, sought to "provide new insights into the inputs, incentives, and beliefs that shape their reporting" by interviewing 462 financial reporters about their jobs. One of the respondents, Mike Bird of the Wall Street Journal, tweeted out the demographic characteristics of the respondents. Just 3.94 percent said they were "conservative" and 0.46 percent called themselves "very conservative," while 40.84 percent called themselves "liberal" and 17.63 percent described themselves as "very liberal." The findings of the reporters' political leanings mirrors that of Politico surveys of the White House press corps in 2016 (zero Republicans among 72 reporters surveyed) and 2017 (three Republicans out of 63 surveyed). 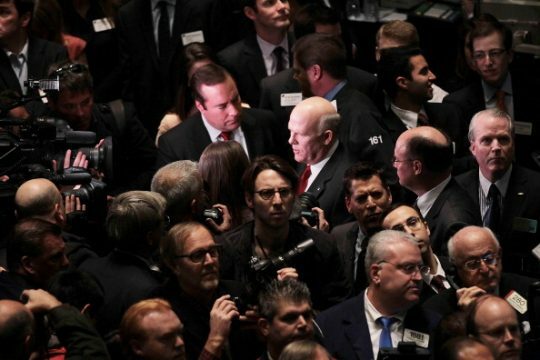 Former George W. Bush administration press secretary Ari Fleischer noted the disparity in the financial journalist study. Two-thirds of the respondents were men, more than 62 percent of them had at least 10 years of experience in the field, and more than 60 percent were at least 40 years old. About 70 percent of them made at least $75,000 per year. The study's abstract discussed the finding's themes, one of them being many of the financial journalists surveyed "lack financial sophistication" and relay heavily on private communications with company management and listening to sell-side analysts. UPDATE: 4:47 P.M.: This article's headline initially stated liberal journalists outnumbered conservatives 19-to-1, but the correct ratio is about 14-to-1. This entry was posted in Politics and tagged George W. Bush, Media. Bookmark the permalink.